Nearly 12 million American workers ‒ mostly in California and New York ‒ will get pay raises on New Year’s Day, thanks to rising minimum wages in 19 states and in cities and counties. The $15 an hour will only apply to some workers in Seattle, Washington. The highest statewide minimum wage in the country will be $11, in Massachusetts and Washington. The pay floor in the District of Columbia will top that, though, rising by a dollar to $12.50. Some states, such as New York and California, are taking a regional, rather than one-size-fits-all approach, to pay. Wages in New York City will rise based on industry from between $9 and $10.50 to $10.50-$12, while workers in the Big Apple’s close-in suburbs will see an increase to $10. Wages in the rest of the state will rise to $9.70. In Silicon Valley’s Mountain View (where Google is headquartered) and Sunnyvale (Yahoo’s home), the minimum wage will rise from $11 to $13. 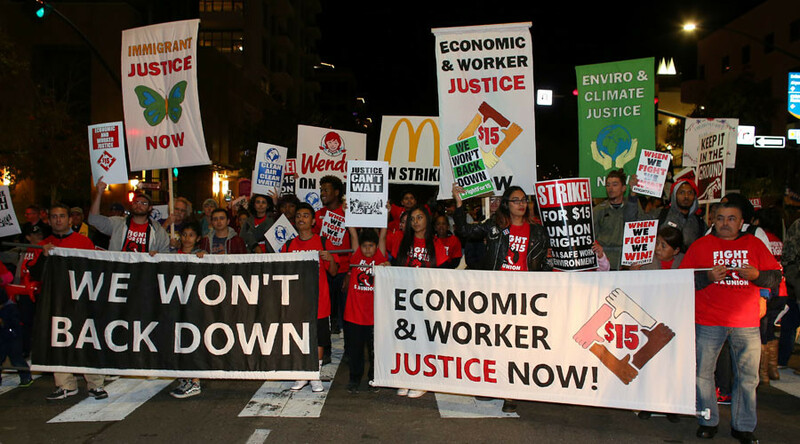 Overall, California is raising its minimum wage to $10.50, but only for large businesses. It will remain at $10 for companies with 25 or fewer employees. The increase will still affect 1.7 million people in the Golden State, according to the Wall Street Journal. On New Year’s Day, Seattle, Washington will become the first municipality to hit the vaunted $15 an hour goal, but only at large businesses with more than 501 employees that don’t offer medical benefits. Voters in Arizona, Colorado, Maine and Washington approved a rise in pay during the 2016 election campaign. The minimum wage increase is being challenged in court in Arizona, as well as in Arkansas, Michigan and Ohio, AP reported. If Arizona’s increase isn’t overturned, the state will have the biggest jump in wages in the country, going from $8.05 to $10.00, or a 19.5 percent pay raise, and it will affect nearly 12 percent of working Arizonans. So far, the state Supreme Court has said it will not stop the law from going into effect, but must still decide whether to hear the case in February, according to the WSJ. Wages are automatically rising in seven states (Alaska, Florida, Missouri, Montana, New Jersey, Ohio and South Dakota) based on indexing.